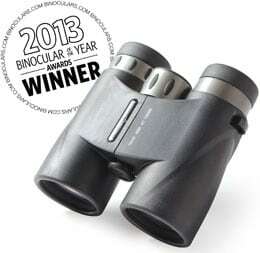 Now into it's fourth year Binoculars.com, a Hayneedle store and one of the biggest dedicated optical webshops have recently published their selections for their 2013 Binocular of the Year Awards. 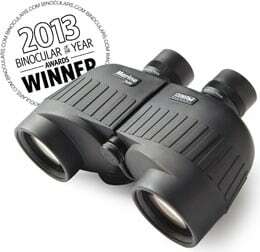 Binoculars.com tend to release their awards early on in the year, whilst I like to announce my Award winners towards the end of the year when I have had more time to review as many binoculars as possible. Binoculars.com say that they looked at and tested "tons of binoculars", both new and ones that were improved in 2013. These tests were carried out both in the office and out in the field and thus they say they could better "judge their performance at both a macro and micro scale" as well as take a good look at just how well they are made. What Binoculars.com say: "Three-time winner! These incredible binoculars - introduced a couple of years ago - keep barreling forward, gathering recognition and awards at a speed that makes the competition a blur. Once again Binocular of the Year, the Legend Ultra HD provides a level of light transmission and clarity that's otherwise unseen in an attainable class and category. With high-quality ED glass coated with proprietary Ultra-Wide Custom Band Coating, viewers are treated to high-definition lines and accurately defined colors, even at tough times of day. All the little things are provided with this pair, too, along with the not-so-little Bushnell full-year buyback guarantee. Permanent RainGuard HD water-repellant coating, a super-comfortable lightweight rubberized body, and a premium case round out the extras included with the Legend Ultra HD. 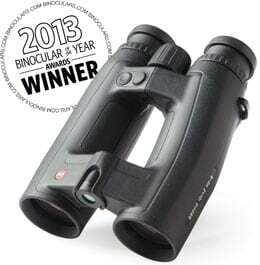 We've never named a binocular the overall winner 3 years in a row, but there's just so much to love here. The price is right, the views are bright - we'll gladly take the Bushnell Legend Ultra HD 10x42 Binoculars out into the field anytime, anywhere." What I say: Costing just under $250 (£230) and with tons of top spec features like a Magnesium body, Prime ED glass and Ultra Wide Band Coatings, phase-coated BaK-4 roof prisms as well as an included binocular harness, it is easy to see why the guys at Binoculars.com like these so much and have given them their most prestigious award three times in a row! What is more, for a 10x42 binocular to have a width of view of 340ft at 1000 Yards is excellent and their Close Focusing Distance of only 6.5 ft. is also very good. 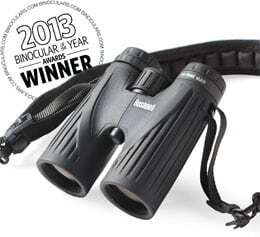 These 10x42 Bushnell Legend Ultra HD Binoculars cost about $250 in the US and £230 in the UK. What Binoculars.com say: "Whoa. It seems obvious to say it, but the Zeiss Victory 10x42 HT has to be seen to be believed. This year's Best of the Best binocular boasts unheard-of specifications like 95% light transmission and a slew of incredible proprietary elements. With Schott HT high-transmission glass, Carl Zeiss T* multi-layer coating, and the Abbe-Konig prism system, the views are brighter and better than literally anything else we've looked through this year. In a uniquely elegant and effortless ergonomic body design dubbed Comfort-Focus-Concept, the Victory HT's are more than a deserving victor this year." What I say: What a great choice as there is absolutely no denying that these Zeiss binoculars are up there with the very, very best. I wrote an article a short time back on these New Zeiss Victory HT Binoculars when they were first released and highlighted many of their great qualities including the use of HT lenses by SCHOTT that are said to have a transmittance that is greater than 95%. 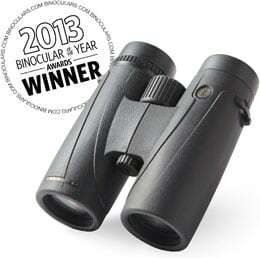 Their choice for last years winner, the excellent Swarovski 10x42 EL Swarovision Binoculars were also very worth winners and I think must have run these very close once again. What Binoculars.com say: "To see the bird, be the bird. That means being fast, reactive, and incredibly lightweight like the Nikon 8x42 Monarch 5 Binoculars. These new birding binocs are prepared to go from in your hand or around your neck to on your eyes and in action with a fast focus and easy turn-and-click eyecups. The rubber-armored waterproof body can handle the morning dew or an afternoon shower, and the lightweight build won't cause a sore neck. They're no dodo in the optics department, either, with Nikon Eco-Glass lens and prism elements with dielectric high-reflective multi-layer coatings." What I say: The winner of this birding award in 2012 was the Nikon Monarch 3 8x42, which just like this years winner, the Nikon Monarch 5 8x42 binoculars is a rather strange choice. It is true that an 8x42 configuration is probably the most popular choice for an all-round bird watching binocular, but what is almost always also desirable for this use is a wide field of view (FOV). The 8x42 Monarch 5 has a FOV of 330ft wide at 1000 yards, which is not bad, but as you can see is less that the Binocular of the Year winner above, the Bushnell Legend that has a FOV of 340ft at 1000 Yards and comes with a 10x magnification. However other than that, there is no denying that the Nikon Monarch 5 is a very good pair of optics and have a host of other great qualities including fully multi-coated optics, ED elements in their objective lenses as well as Dielectric High-Reflective Multilayer Prism Coatings that will ensure that they not only have a high level of transmittance for a brighter image, but the image quality should be excellent as well. What Binoculars.com say: "You're looking to take a shot - it doesn't make sense to have a warped field of view. Our 2013 Best Hunting Binocular is the Leupold BX-4 McKinley HD 10x42, an all-new model for the year that boasts a full-flat field of view with super-sharp lines and vivid colors. These high-end lightweight binoculars also feature Extended Twilight lens coatings for spotting shots in the early and evening hours and easy, fast center focus that helps you zero in. Partner that with legendary Leupold ruggedness and dependability and you get a hunting partner that won't let you down." 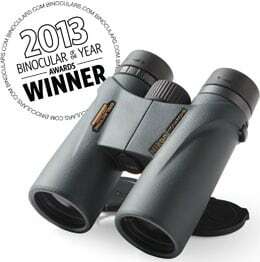 What I say: I would love to get the chance to test and review these Leupold binoculars as they look great. Top notch features include HD extra low dispursion glass lenses, a strong, waterproof, lightweight magnesium alloy chassis and a FOV of 336 ft, which for a 10x bin is excellent. All in all these really do look like a great choice as a hunting or general wildlife observation binocular. What Binoculars.com say: "Go big or go home! 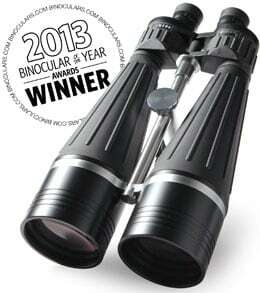 The Zhumell Tachyon 25x100 binoculars do. This year's best astronomical binoculars are housed in a no-funny-business industrial-strength body and boast high-quality optics worth pointing skyward. As a spotting scope for your telescope, a primary moon or object viewing instrument, or tripod-mounted long-distance terrestrial binoculars, the Tachyons are designed to help you open new horizons. The optics on the Tachyon - BaK4 prisms, a waterproof and nitrogen-purged body, and fully multi-coated lenses - are supported by an even spacier feature - the ability to accept standard 1.25-inch telescope filters." What I say: Binoculars.com have gone even bigger this year! Last years winner were the 20x80's also from Zhumell. This year they have opted for the giant 25x100mm version, which won the award in 2010 and 2011! Like last year, the Zhumell Tachyon 25x100 Astronomy Binoculars at around $240 look like an excellent choice if you are after a reasonably priced way to view the night sky. The giant 100mm objectives, fully multi-coated optics and Bak-4 prisms will help to ensure that plenty of light gets to your eyes for a great view of things like the craters on the moon or with the 25x power, even features on other planets. The relatively wide FOV of 157 ft. @ 1000 yards, means that they will work well for scanning the heavens looking for features and constellations. With a built-in tripod adapter, these bins have an individual eyepiece focusing system, which takes a little more time to adjust, but can help with the most precise adjustments to get a perfectly in focus image. It also accepts standard, 1.25-inch astronomical filters over the eyepieces. What Binoculars.com say: "Ahoy! We were impressed with the Steiner 7x50 Marine Binoculars the moment we got them aboard the boat. These darn-near-indestructible waterproof binoculars bring German engineering and optics onto the water without a yacht-class price tag. Against the wetness, they wield black rubber armor throughout, eyepieces with rain and spray guards, lens caps, and a web strap. On the eyes, they impress fully multi-coated lenses, BaK4 prisms, and Steiner's signature Sports-AutoFocus system. With it, just set your binoculars for your eyes once and view everything in focus from 20 yards to infinity." What I say: Known as the Steiner Navigator in Europe, these binoculars with their large 50mm objectives fully multi-coated optics and 7x magnification will help to ensure that the image you get onboard is both bright and steady. These binoculars also have a Fixed focus , or a "Sports-AutoFocus system" as Steiner like to call them, which means you don't have to bother with focussing on rough water. This simpler design also makes them much easier to fully seal ensuring that they are completely watertight. Overall, I would say that these make a worthy choice for the best Marine binocular, but also check out my guide to Marine Binoculars for some more choices. The Steiner Marine 7x50 Binoculars cost about $300 in the US or £320 in the UK. What I say: This year Binoculars.com have opted for a more budget minded binocular as their winner of the best compact binocular of the year and whilst they my not match last years winner, the Zeiss Victory Compacts, I do think that for their price, they are a great little pair of compacts. These roof prism compacts have a double hinge design that I love on a compact because it means that can fold up to a much smaller package and which makes them a true pocket binocular, perfect for travel, safaris, taking to sporting events or anywhere else where size (or lack of t) is really important! 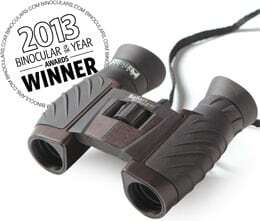 For more on the duel-hinge design, view this article on the Best Compact Pocket Binoculars. What Binoculars.com say: "Some of our best reviewers don't even work here! 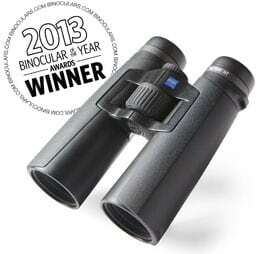 Because of our customers, the Zhumell 10x42 Short Barrel binoculars are now back-to-back winners of our Reviewer's Choice award. Nearly unanimously, people who have bought these unique binocs tell us they love their strength, quality, compact size, and high value. At under 24 ounces, they're able to take 42mm multi-coated lenses, a waterproof body, and easy comfortable eyecups just about anywhere. For the enthusiast, hunter, birder, bleacher bum, traveler and many others, the Short Barrels are an easy and affordable way to get closer to the action"
What I say: As I have not used or tested these Zhumell binoculars, I can't comment on their actual performance but with some good features like fully multi-coated lenses they look like a decent buy with a price tag of only $120. However at 293 ft. @ 1000 yards, their FOV is not that great, nor is their 15.1 mm of eye-relief, but their close focusing distance at 6.5 ft is excellent as are their compact dimensions. For some other options, read my guide to the Best Cheap Binoculars under $200 / £200. What Binoculars.com say: "Advance Ballistic Compensation in a binocular. That's right. Leica has continued the tradition of continually upping the ante in high-tech optics with 2013 Innovation of the Year, the Geovid HD-B Laser Rangefinder Binocular. ABC, as it's called, allows hunters to upload ballistics data for their equipment and accurately calculate their shot based on ballistics curves and real-time distance, angle, temperature, and air pressure calculations. All within .2 seconds. This incredible technology is paired, of course, with state-of-the-art optics from Leica, with a new Perger Porro prism system and unparalleled optical performance. You didn't know it until just now, but you need this." What I say: These are not cheap, but if it is the very, very best hunting binocular you are after then these must surely be on everybody's shortlist. As well as the hunting specific features mentioned above they have all the optical components and coatings that you would expect to find in any binocular in this price range and all wrapped up in what must be said is a beautiful looking open bridge body.